If you were trapped behind a large stone and all you had was a feather with which to free yourself, what would you be an hour later? A day later, a week later – it doesn’t matter. The tool isn’t right for the job. It’s powerless. And that’s what every form of external, self-driven righteousness is. Powerless. Good works? Powerless. Obedience to the Law of God? Powerless. Religious observances? Powerless. 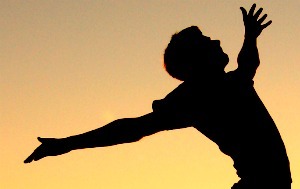 The rock of God’s righteous requirements can only do one thing – teach us how impotent we truly are. So that we are finally ready for an all-powerful Savior. But the Scripture imprisoned everything under sin, so that the promise by faith in Jesus Christ might be given to those who believe. Now before faith came, we were held captive under the law, imprisoned until the coming faith would be revealed. So then, the law was our tutor until Christ came, in order that we might be justified by faith. But now that faith has come, we are no longer under a guardian. (Galatians 3:22-25). If you are feeling the futility of self-driven righteousness – if you sense that the feather of your efforts cannot possibly be equal to the weight of your sins – then you are in the right place. You are being “tutored” by the Law so that you despair of anything less than the gift of God, a righteousness earned and granted by another. You are learning that feathers do not move rocks. Only when we finally give up on our own efforts at righteousness do we cry out for the righteousness of another, one who imparts His salvation by faith alone. The dead and the powerless do not move stones. They are imprisoned in impotence. 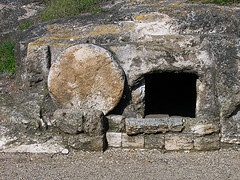 Jesus, having absorbed our sins through death on a cross of judgment, burst out of a rock-sealed tomb on the third day. Death-overcomer? Stone-mover? That’s the Savior I need. He is willing and able to move your stone, your spiritual death and powerlessness, as well. Some people doubt that Jesus rose from the dead. That God extended (and extends) His hand of supernatural power into our little world of brokenness and need. This man didn’t. He was broken and disabled from birth. Everyone knew him as the pitiful figure begging at the gate – now he was not merely walking, but leaping. And praising God. Peter and John had no magic incantations to offer. They were servants of a risen Lord, and it was in the name of Jesus that this man rose and began to walk. Until you look in the mirror and see a broken and disabled soul, made powerless by sin (a far greater crippler than any birth defect), the message of Jesus, His compassion, His power, and His resurrection will not make any sense. It will seem a fantasy. Not to this guy. Easter would not be some arbitrary day on the calendar. It was, and is, life indeed.